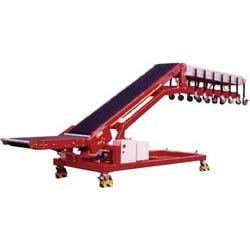 Continuous / Intermittent Flat Belt Conveyor Systems with PVC conveyor belt of size 300 mm width X 1500 mm long & 900 mm height Powder coated steel machine, having a speed of appx. 13 meters / min. It has adjustable guides on both sides for straight guiding of pouches, labels, cartons, bottles, cans, etc. 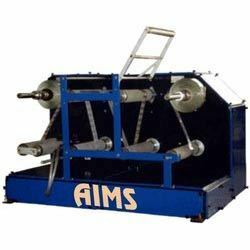 & is suitably designed to provide proper conveyance to objects for proper Ink Jet Printing (Model IJP-P2128 / Prodigit). Belt will be imported German Endless PVC Sandwiched black colored Belt. Frame will be of M.S. Fabricated and powder coated structure. (Dark Blue). M.S. adjustable Side guides will be provided for product alignment. All bearings will be of reputed make like SKF/TR/KG etc. All nut bolts will be of high tensile make. System will be provided with Tensioning and Tracking arrangement. High Speed Auto-Feeding Stacking Conveyor with Conveying System Model SCS – 1500 of size 300 mm width X 1.5 Meter long & 900 mm height Powder coated steel machine for automatically dispensing pouches, labels & cartons (Max. size 300mm X 200mm) from the stack at high speeds. This finds wide usage with the Ink Jet Printers (Model IJP-P2128 / Prodigit) & can be used to automatically feed large quantities of Labels, Pouches & Cartons at high speeds with guaranteed accuracy for picking of single item from the vertical or slanted stack. The labels, pouches or cartons are stacked on the slanting tray (Dispenser) for feeding, automatically picked up by the pick-up rubber friction insert, fed below the Print Head one by one via guide track and timing chain & stacked back in the collection tray automatically at very high speeds. This is a rugged Heavy Duty Stainless Steel Machine which can be customized as per design & requirement. The labels / pouches (& cartons) are stacked and automatically fed by slant magazine at speeds of 60 / 90 / 120 per minute. 32 & 38 mm. Std. In any paper, film and foil conversion industry, the Unwinding & Rewinding Machine is specially designed for correcting badly wound rolls for removing the mis-registered and rejected material before it goes for final delivery. 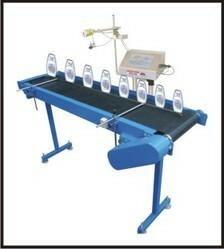 In order to rectify salvage such rejection, the Doctoring machine has been specially developed. 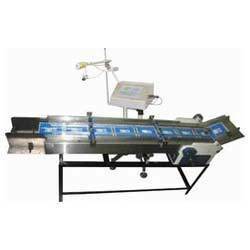 Also, it is used widely for on-line printing of Mfg. Dt., Exp. Dt., B. No., etc. using Ink-Jet Printer (Model IJP-P2128/PRODIGIT-18) or other contact coding machines (Model BCC-35-O or HRC-35-O) from Roll to Roll at high speeds & then these printed rolls are used in the various packaging machines. Structural Fitting M. S. Channel frame body with Mechanical clutch & break unwind / rewind system, unwind / rewind shaft & cones for printed material holding cores, for printed material holding cores, alu - Guide Roller & all other standard accessories. We offer high quality & high capacity Truck Loading Conveyor that is used in loading boxes and gunny bags into truck and used for moving them into higher places for stacking purposes. Our clients can avail these at competitive prices and we meet customized requirement.